Featured in our 5th Annual Faces of Sports Issue! The Seven Summits Challenge, climbing and summiting the seven highest peaks on each continent is a bucket list must for many avid mountaineers. And that’s true for trans woman Erin Parisi; In 2018 she’s already summited three of the seven in her quest to become the first openly transgender individual to complete this arduous challenge – somehow not surprising coming from a woman whose favorite athlete is Amelia Earhart, the pioneer for women in adventure sports. 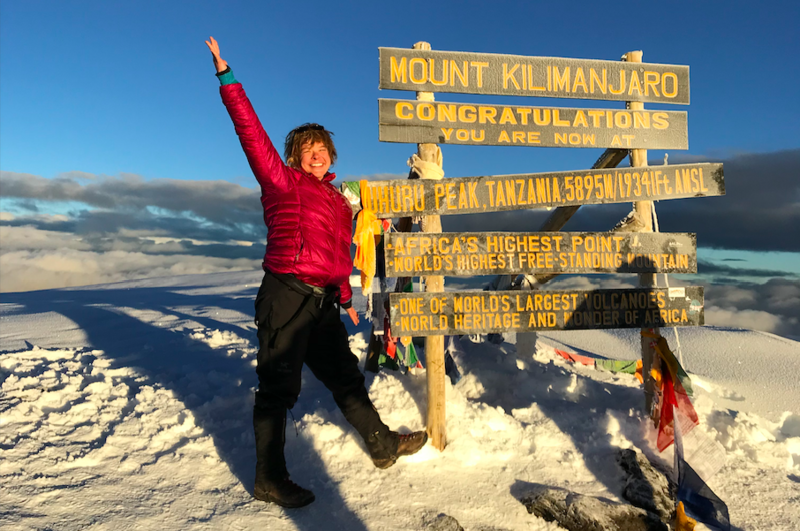 On March 8, 2018, International Women’s Day, Parisi summited Kilimanjaro, Africa’s highest peak at 19,341 feet. This was particularly satisfying since Parisi summited it before in 2015 as Aron (now her dead name) and this year it was Erin who made it to the top. Parisi also founded a nonprofit, TranSending 7 in March 2018 to advance transgender rights and encourage transgender people to get involved in sports. “It’s important for us to show that we have the same goals and aspirations that we had before,” said attorney Emma Shinn, board chair of TranSending. Also a trans woman, Shinn is a former infantry leader and judge advocate in the Marine Corps. “We may look different, we may sound different, but we’re still the same people underneath,” she said. Parisi has always been an athlete and enjoys mountain biking, backcountry skiing, international travel geography and yoga as well as mountaineering. But going for the Seven Summits Challenge is intensely personal for her. Her goal is to provide visibility for the marginalized transgender community. Stating that “discrimination, under-employment, violence, addiction, suicide and poverty are all endemic in many trans lives,” Parisi wants “to overcome the logistic, economic and social barriers” that trans persons must face. In her work to change the narrative for the trans community she’s using the International Olympic Committee (IOC) guidelines for trans athletes competing in the female category. “This means I’ve suppressed testosterone and documented those levels for a year,” Parisi says. “At these levels, the IOC has determined I have no athletic advantage for being pronounced male at birth. Completing the Seven Summits isn’t cheap and it also requires a lot of time away from your day job. Up to now Parisi has self-funded her trips but TranSending will help fund her future climbs. And she’s been with CenturyLink for 16 years, currently as a real estate manager and the company is very supportive about giving her time off and now providing funding to reach her goal.